YOGYAKARTA, 22 Graduates were inaugurated at the April 2018 Graduation. The graduation was held on April 19th, 2018 on BRI Auditorium MD FEB UGM Building. Besides the graduates, the inauguration ceremony was also attended by the vice dean, Amirullah Setya Hardi., SE., Cand.Oecon., Ph.D., the Director of Master of Science and Doctorate Program in Accounting, Prof. Jogiyanto Hartono M., Ph.D., MBA., Ak., CMA., CA., Director of Master of Science and Doctorate Program in Economics, Prof. Catur Sugiyanto., MA., Ph.D., and Director of Master of Science and Doctorate Program in Management, Nurul Indarti SivilØkonom.,Cand Merc.,Ph.D, and Manager of academic affairs, RR.Tur Nastiti., M.Si., Ph.D. The inauguration ceremony was opened with a speech from Prof. Catur Sugiyanto. In the opening of his speech, Sugiyanto congratulated all of the 22 graduates as all of the graduates achieve more than 3.5 GPA. The 22 graduates consisted of 6 graduates from accounting major, 2 graduates from economics major and 14 graduates from management major. He then announced the top three students with the highest GPA, the three students were: Agni Astungkara (accounting), Alivia Rachma Amin (management) and Dewi Nugraheni (Economics). “As you graduate, you have entered a time period when you arrived at a “bus stop”, as each of you will enter different “bus” toward your own future. Some of you will pave your career in the workplace, and some of you may continue your study to doctorate program” Sugiyanto said, as he concluded his speech. The second speech was delivered by the vice dean, Amirullah Setya Hardi., SE., Cand.Oecon., Ph.D. In his speech, he remarked that MD FEB UGM graduates have to contribute to the society. He concluded his speech by emphasizing the importance of ethics to the graduates and he hoped that MD FEB UGM graduate always upholds ethical value wherever they will work. Next speech was the speech by the best graduate in April 2018 graduation, Alivia Rachma Amin. She began the speech by expressing her gratitude toward all the lecturers and staffs of MD FEB UGM. After that, she reminiscing the time when she enrolled in the master of science program in MD FEB UGM. “It was a hard process, but I learned more than just knowledge in MD FEB UGM, I also learned to uphold ethics and integrity in here.” Alivia said at the end of her speech. After Alivia finished her speech, the inauguration ceremony was closed. As the April 2018 graduation comes to an end, MD FEB UGM has graduated 3177 Master of Science and 247 Doctor in Business and Economics. 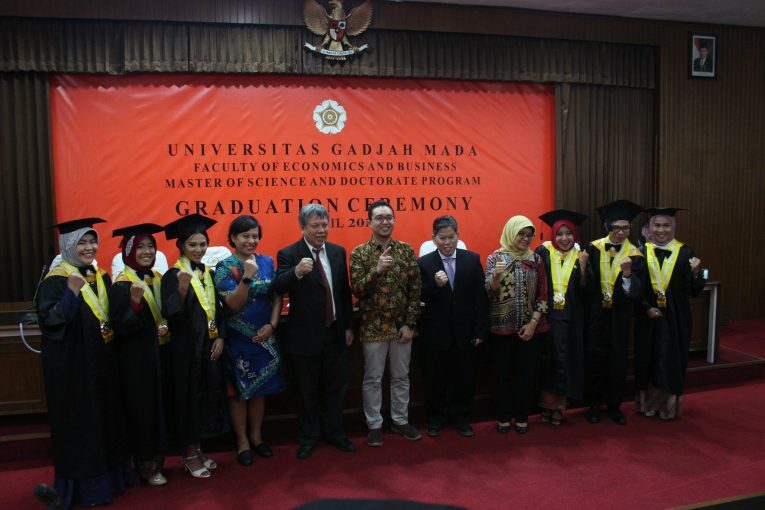 MD FEB UGM Alumni has become leading academicians or professionals in a variety of institutions. MD FEB UGM fully committed to creating knowledgeable leaders with high integrity as stated in MD FEB UGM Mission.